Old Glory, but in a different form. It does not wave. It’s art. 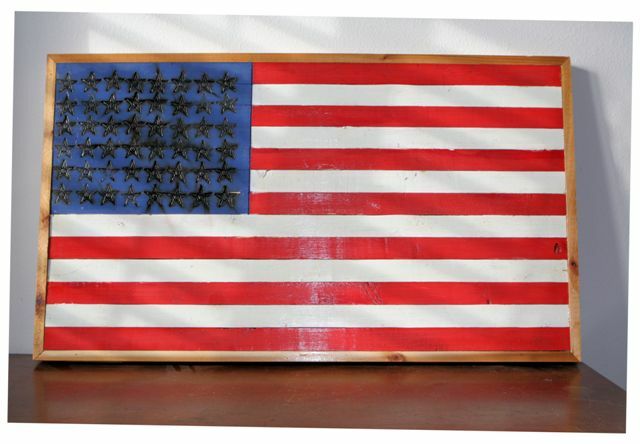 This Old Glory is made from wood by an artisan in Pensacola, Florida. The idea is his alone. He is the only person in the world who makes them. The red and white bars consist of pieces of glued-together wood, and they run the length of the flag. The blue background for the stars is simply a continuation of those pieces of wood, but has a vertical cut on its right side to separate it from the bars. 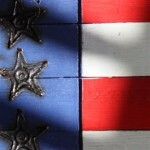 The stars are burned into the blue of the flag with a branding iron heated up in an outside fire pit. The artist says, “On rainy days, that part of the production stops.” Sometimes, genuine light scorch marks appear on the closest white stripe to the blue, signifying that this is the real deal. It does not come from China. It is made one flag at a time. Each is slightly different. Better still, you can order this piece of art with 13 stars in a circle; 48 stars that represent the US before Hawaii and Alaska became states; and in the current 50-star version. The choice is yours. Whichever flag you choose, it will be made to your particular specifications. Sturdy as a rock, these flags can be displayed outside, on your house. Some folks have chosen to do this, and Old Glory looks, well, glorious. Because they are made entirely of wood, the flags are—by normal standards—heavy. For example, the one we have chosen for ourselves weighs 18 pounds. It’s an 18 x 36” model with 48 stars. 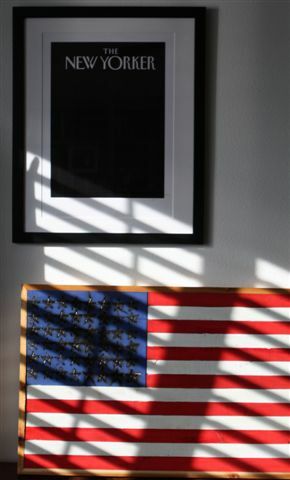 If you choose to display the flag inside your home, we suggest you pay careful attention to where and how you hang it. We forgot to mention that these pieces of art already come framed. In wood, of course. Think of the money you’ll save! Shipping: We ship FedEx Ground and expect shipping costs to average $25; it depends on flag size. Give us a phone number, or some other way to contact you, and we’ll go over shipping costs with you before you commit. Unexpected surprises are not part of the way we do business. Credit cards: VISA & MasterCard + PayPal. 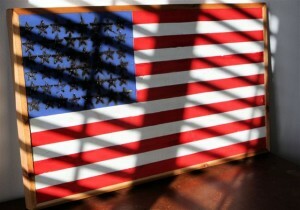 The flags above above are another version of the artist’s central theme, Old Glory. However, these distressed flags–called Tattered Glory–are unique in that each is different and each can bear the artist’s newer version of the five-pointed star. It is more like the original star, and is available on large flag versions only. 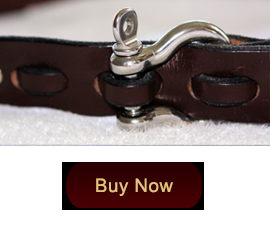 The stylized star on the flags at the top of the page is available, also. Customer’s choice. Old Glory is also now available in a 13-star model. No difference in price. However, remember, the newer version of the five pointed star only works on large flags.